You'll find a fisher's paradise upstream in the Kolan River, at the overflow of freshwater from Monduran Dam. In the floods of the past few years, Barramundi washed over the dam wall and now inhabit the top freshwater sections of the river. There are days when it is nothing to catch 6-8 Barra in a morning session. If you are targeting Mackeral and Tuna, try rolling metal slugs, barra spoons or squid skirts. Drifting with unweighted gar or pilchards is another great option. Also try the north wall for Moses Perch, Bream, Flathead and Whiting. This is a prime area for the elusive Mangrove Jack, Barramundi and Fingermark. Hard body lures, soft plastics, live sprat and proddy mullet are the best options. A great haunt for large Salmon, Trumpeter and Mangrove Jack. For those of you who enjoy a feast of mud crab and prawns, Rubyanna Creek is the ideal place to target these crustaceans. Bring out the Whiting and Flathead gear because that's what you are likely to bag. Fresh yabbies and sand worms are a must. You will find this by a large bank of rocks jutting out from the shoreline. The ideal spot for Bream, Cod and Moses Perch. Prawns, squid and soft plastics are the pick of the baits. Best fished at high tide, make a quick stop at the hot water outlet behind Millaquin Mill on the way. A prime area for Trevally and Queenfish; small chrome slugs and soft plastics are ideal. At the town reach, the soft plastics anglers will notice a vast array of structures riddled with oysters, so you can certainly need to have your wits about you in this area. This is one of the deepest holes in the river, so set a line with live bait (prawns, squid, mullet) to lure Salmon, Trumpeter, Bream, Cod and Flathead. Also good at high tide this large ridge of rocks crossing almost halfway across the river, so do take care in this area. Mangrove Jack, Bream, Trumpeter, Whiting and Flathead are the species will target here. Again, you need the right tide to reach here and it's another prime area for mud crabs and prawns. 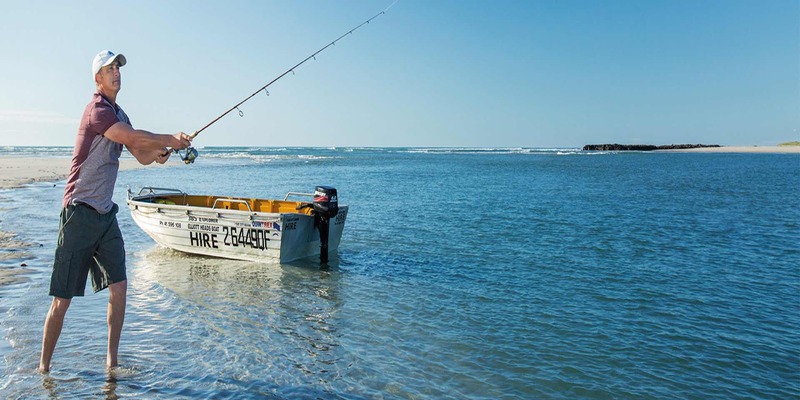 Hopefully after these hot tips you will have a variety of fresh, Burnett seafood on the menu for the evening meal and always remember to limit your catch - don't catch your limit.